Each of these albums records a set from one concert, held at at St. Leonard’s Shoreditch Church, London, in December 2011, the night after the concert by François Carrier, Michel Lambert, John Edwards and Steve Beresford that is documented on Overground to the Vortex (also reviewed here). 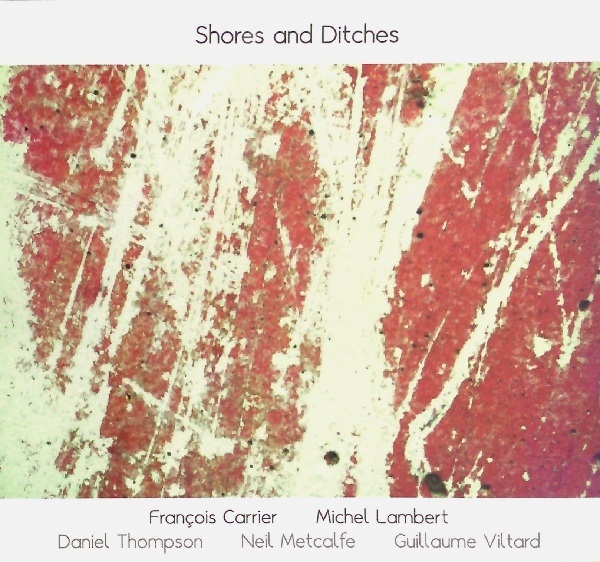 Neil Metcalfe flute; Guillaume Viltard double bass; Daniel Thompson guitar. The trio on this recording, presents an uncommon and intriguing all-acoustic lineup of flute, double bass and guitar. And, refreshingly, there’s no hint of the lowercase aesthetic that’s been predominant in London in recent years. 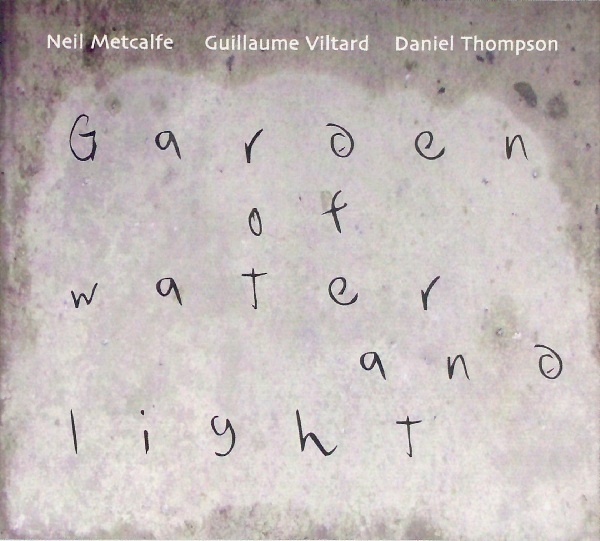 Balancing abstraction with melodicism, Garden of Water and Light is judged so astutely as to assume the substance of a piece of carefully notated chamber music. It’s unlikely you’ll hear this as a corollary to anything else. Bassist Guillaume Viltard, in particular, is on superb form throughout, and acts as the trio’s fulcrum, often fleshing out the thinner lines of his companions with broader, more vibrant soundings. He meshes particularly well with Thompson, who essays a range of variegated approaches that hedge between influences: shades of Eugene Chadbourne with an often loosely-strung, metallic skittering sound; occasional reminders of John Russell’s convulsive scrabbling; and cleanly individuated single notes. Metcalfe’s flute rides thermals above the strings’ groundwork when he solos and, in calmer moments, suffuses and shades their lines. Avoiding tart sound effects he mostly plays mostly softly, and only occasionally touches on oriental tonalities. 17 minutes into the long title piece, the mood darkens. Metcalfe briefly drops out, and Thompson restricts his playing to sparse string-scrapes and brief barbs, while Viltard bows gravidly. When Metcalfe rejoins, the flute brings a measure of tranquility, meshing beautifully with Viltard’s smeary bowing at one point, until the performance draws to its end with an unexpectedly rhythmic passage of repeated string-strikes from Viltard. A flurry of percussive, rhythmically charged rapping and tapping precedes a brief, mildly frenetic coda in which Metcalfe’s flute flitters, as giddy as refracted light across the soundfield. The second, and final piece, “Vimeth” (9:30) is more direct. Viltard plays forceful, irregular thrums, before subsiding into softer but determinedly rhythmic strumming. As Metcalfe and Thompson solo, he compliments his own bowing with slaps and knuckle raps on the body of the bass. The recording and mastering of the album was handled by François Carrier, with excellent results: the presence of all three players is vivid and immediate, so with one’s eyes closed it’s almost possible for the listener to imagine themselves into the “extraordinary space”, as Thompson describes it, of the church. François Carrier alto saxophone; Guillaume Viltard double bass; Michel Lambert drums; Neil Metcalfe flute; Daniel Thompson guitar. Shores and Ditches was recorded at the same concert as Garden of Water and Light. Carrier not only engineered and mixed this album’s sound, and took the numerous photographs of local texture on the cover, but he plays alto saxophone on it too. It’s primarily his and drummer Michel Lambert’s date, but Viltard joins them on “Upstream” (track two), and Viltard, Metcalfe and Thompson make up a quintet on “Wadi” (track five), the album’s two longest of six tracks. Many jazz musicians make their way by travelling from concert to concert, hooking up with local musicians en route; but Carrier and Lambert are unusual in the closeness of their association. Seldom touring apart, they’ve compiled a considerable catalogue of work by documenting various city stops, each with a different local bassist and occasional additional guests: witness the previous night’s concert by Carrier and Lambert with John Edwards and Steve Beresford, as documented on Overground to the Vortex. Carrier leads with light, airy tonalities that test the resonance of the church’s vaulted space, and that sets the mood for a performance that often luxuriates in its expansive acoustic, maintaining a lot of open space within which collective or individual improvisations can unfold freely. Lambert adds some urgency to their first duet, “Caldera”, by switching from sticks to mallets for a fuller, more rounded sound, before provoking Carrier to a fiery outburst on reverting to sticks. “Upstream”, the trio performance, is initially piloted by Viltard, with a nimbly rhythmic stepwise pizzicato, but it opens up after an exploratory passage of textural bowing. Sometimes the reluctance of any individual to dominate a performance is frustrating; here it allows the trio to shape a finely-calibrated performance in which they slowly twine together, through a powerful surge of energy to a gradual dissolution. Two further sax/drums duets, “Lave” and “Reef”, are both brief and both restless, with Lambert agitating Carrier to constrained flights of impassioned melodicism. “Wadi” begins with Metcalfe’s flute piping airily over abstractions of picky string sounds and dispersed percussives, with the comparably weighty alto coming in only as these many small frictions produce a degree of heat. Rather than lapse into introspection or build inexorably to climax – though rhythmic intensities do peak, and Carrier utters sharp, urgent cries before the close – the quintet mostly sifts, aggregates and recombines their energies with restless curiosity. The album ends with Carrier solo on the album’s seven minute title track, and he begins as the St. Leonard’s campanologists ring their changes. At first clear and present, the bells subsequently ghost in and out of focus, while Lambert (I assume) adds the rustle of sleigh bells, leaving off once Carrier’s solo gains true substance. There are also needle-sharp bell tones right at the end of the alto’s final, unaccompanied and elegantly-shaped soliloquy. This entry was posted in Album and tagged Daniel Thompson, François Carrier, Garden of Water and Light, Guillaume Viltard, Michel Lambert, Neil Metcalfe, Shores And Ditches. Bookmark the permalink. Thanks for attention and listening skills! FC.